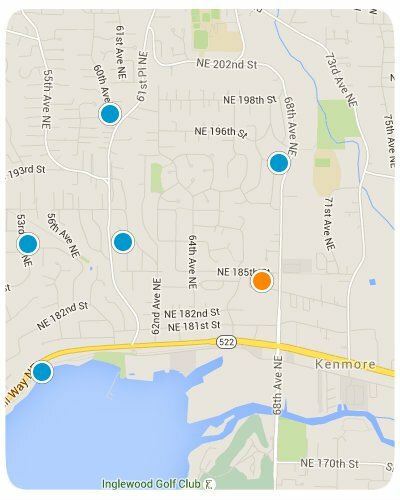 SearchHomesNW | Kenmore Real Estate-Easily search all Kenore homes and condos for sale. Kenmore is a city in King County along the northernmost shores of Lake Washington. Prominent features include the nation's largest seaplane-only, commercial air facility at Kenmore Air Harbor, as well as several waterside parks and marinas, and easy access to the Burke-Gilman Trail and the King County bike-trail system. The most widely known attraction in Kenmore is Saint Edward State Park, which has a rich history all its own. Originally a Native American camping and fishing ground, the land was purchased by the Archdiocese of Seattle and a Catholic seminary school was built. Eventually, the land was sold back to the state to be used as a park. Now, there are many miles of trails, waterfront activities, and one of the coolest play structures you’ll ever see. Homes for sale in Kenmore vary: there are Condos For Sale In Kenmore, Town-Homes For Sale In Kenmore, and Single-Family Homes For Sale In Kenmore. There are also many New Homes For Sale In Kenmore and many under construction. Thank you for using SearchHomesNW.com to find 30% more listings than Zillow, Trulia, and Realtor.